Registration opens April 26, 2019. Class runs from May 17 thru July 21, 2019. Sign up for email notifications for my next classes in my right sidebar. Thank you! Everyone needs a little closure…especially when making jewelry! Why not make it beautiful? In this e-course I’ll show you how to create unique and versatile closures. You’ll learn to create several different hook and eye style closures including my favorite “go to” clasps…super strong and super beautiful. Ever want to make your own toggle clasps? I'll show you how. We’ll be creating stacked loop and button closures with layers of metal, mica, paper, beads, fabric and pre-drilled found objects. I’ll also show you how to incorporate those gorgeous vintage rhinestone clasps into your work. To take it one step further, I’ll show various ways to make end connectors for leather, rubber and even rhinestone chain…a very handy skill to know. 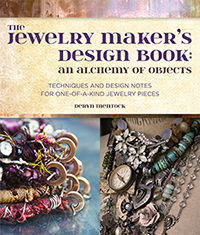 This class will grow your jewelry making expertise and give you a multitude of unique and inspiring options for finishing your pieces. To see what my students have said about previous classes, please click here and scroll down. Important: I accept Paypal payments only. Your Paypal email address MUST be the one you would like the classroom password sent to, otherwise you won't receive the log on information. Also, please make sure your full name is included in your paypal payment information. Due to the online nature of this class, no refunds once your registration is complete and you're provided the class password. Your payment registers you into the class. Please allow three days to receive the log on information to access the classroom. Once in the classroom, you will be able to access the tools and supplies list and watch a few intro videos. The workshop will run for just over two full months on my private classroom site. All videos will be posted on the first day of class. Once the videos are posted, students will be able to view them at any time. This means you can work in your jammies at three in the morning, if you like! I will be available the entire duration of the workshop for questions and troubleshooting. PDF's of the complete tools/supplies list will be provided after registration.